Attorney General Eric Holder made a curious selection for the closing speaker at a July 20 Justice Department conference marking the 45th anniversary of the landmark Civil Rights Act of 1964. Rather than turning to a lion of the movement, or a figure whose success in life was made possible by the bill, Holder turned to Arab American Institute (AAI) President James Zogby. It's a curious move because - despite his generally favorable public image – an examination of Zogby's record shows he is an apologist for Muslim Brotherhood-linked groups like the Muslim Students Association (MSA) and terrorist organizations like Hamas and Hizballah. On top of that, he is a strident foe of the federal government's efforts to cut off funding for terrorist organizations, including efforts by Holder's department. Zogby's address barely touched on the significance of the Civil Rights Act. Instead, Zogby used his speech to settle some partisan political scores and depict himself and other Arab-Americans as victims -- of murder; death threats; "blacklisting" and "harassment;" "stereotypes;" "defamation;" and even harsh U.S. immigration laws that turned his father into an illegal alien. Zogby attacked the Bush Administration for detaining Arab and Muslim immigrants and visitors right after the September 11 attacks (neglecting to mention the fact that the detainees were in the United States illegally.) He denounced former Attorneys General John Ashcroft and Michael Mukasey for attempting to delineate how ethnic/racial profiling might be used to prevent terrorist attacks. Zogby's speech included not a word about the sacrifices of Dr. Martin Luther King or other civil-rights workers who responded with non-violence in the face of jailings, vicious beatings and murder to make the 1964 legislation a reality. But it did include a note of self-praise for Zogby and others like him who worked in the Rev. Jesse Jackson's failed 1984 and 1988 presidential campaigns – which Zogby in turn used to promote his own organization, AAI. "It was out of that experience that our AAI was born as an empowerment project to continue our progress into the mainstream of American politics," he boasted. But the substance of Zogby's worldview - particularly when it comes to terrorism and other Middle East-related issues – is anything but moderate. Although he is an Arab Christian, Zogby's positions over the years often echo those of radical Islamist groups like the Council on American-Islamic Relations and the Muslim American Society, both rooted in the Muslim Brotherhood. On September 16, 2000, AAI joined CAIR in cosponsoring a rally in front of the White House in support of the Palestinian "right of return." In October 2003, AAI and CAIR co-sponsored a "Civil Rights Conference" in Dallas to mobilize opposition to the Patriot Act. Like CAIR, Zogby sought to whitewash an Obama campaign official's ties with the Muslim Brotherhood-linked MSA. Like CAIR and MAS, Zogby demands that Israel withdraw from the West Bank, but refuses to condemn anti-Israel terrorism and violence from Gaza, from which Israel unilaterally withdrew in 2005. In March 2002, Green Quest launched a series of raids against Northern Virginia-based organizations that were suspected of financing terrorism. The raids targeted sites affiliated with the SAAR Network, described by federal investigators as a network of up to 100 nonprofit and for-profit organizations that "are interrelated through corporate officers and holding companies – subsidiary relationships, to facilitate the funding of terrorist operations." ." The groups were suspected of funding Hamas and Palestinian Islamic Jihad (PIJ) – terror groups responsible for hundreds of deaths during the past two decades. "Fear and confusion now prevail in our communities and many believe the government has plans to punish all Muslim organizations without clearly establishing a credible link to an ongoing criminal investigation. This is not acceptable." One of the groups raided was the International Institute for Islamic Thought (IIIT), described in an FBI affidavit as a front to support Hamas and the PIJ. When Zogby appeared on "Hardball with Chris Matthews" less than a week after the raids, Matthews asked him if IIIT is "a dangerous group or not." "The Ikhwan [Brotherhood] must understand that their work in America is a kind of grand Jihad In eliminating and destroying the Western civilization from within and 'sabotaging' its miserable house by their hands and the hands of the believers so that it is eliminated and God's religion is made victorious over all other religions." Ramadan Abdullah Shallah, the current secretary-general of the PIJ, served as a director at the World and Islam Studies Enterprise (WISE), a think tank and academic research center funded by IIIT. Shallah, who headed WISE from 1991-1995 before emerging in Damascus as the head of the PIJ, wrote "that IIIT was the largest contributor to WISE." In November 2001, the Justice Department stated that WISE was among "front organizations that raised funds for militant Islamic-Palestinian groups such as the Palestinian Islamic Jihad (PIJ) and Hamas." During the early 1990s, WISE was home to four members of the PIJ's governing board, including senior operative Sami Al-Arian. Despite clear evidence of PIJ leaders at WISE, and public videos showing Al-Arian's extremism, Zogby's AAI denounced Al-Arian's 2003 arrest on conspiracy charges as an example of "profiling" and "specious charges." Likewise, Zogby defends the Saudi Arabian government despite its longstanding role in funding radical Islamist groups and terrorism. In a 2005 article, he asserted that "anti-Saudi propaganda has become a tool to smear critics and target efforts to build ties between Saudis and Americans." Furthermore, in 2004, when Palestinian organizations refused to sign a pledge stating that U.S. foreign aid would not be used to support terrorism, Zogby questioned the very concept of barring material support for terrorism. Requiring groups to do so "compromises the ability of the humanitarian organizations to function," he claimed. Additionally, Zogby has opposed efforts to prevent Americans from financially supporting the terrorist organization Hizballah. Interviewed by the Washington Post for a May 8, 2003 article, Zogby said: "By criminalizing attempts to send money to Hezbollah or to support it, the FBI is confusing and alienating people here who could be allies in the war on terrorism." Likewise, Zogby has defended other US-based supporters of Middle East terror groups. In October 2000, the Investigative Project on Terrorism videotaped Abdurrahman Alamoudi of the American Muslim Council at a rally across the street from the White House announcing his support for Hamas and Hizballah. When then-New York U.S. Senate candidate Hillary Rodham Clinton's campaign announced it would return Alamoudi's contribution, Zogby claimed Alamoudi was a victim of a "shameful hysteria campaign of McCarthyism." Four years later, Alamoudi was sentenced to 23 years in prison for terror-related crimes which included participation in a Libyan plot to assassinate the then- Crown Prince of Saudi Arabia. In August 2008, Mazen Asbahi, Sen. Barack Obama's Muslim outreach coordinator, resigned from the Democrat's presidential campaign following reports that he had been affiliated with various Muslim Brotherhood-linked organizations, including the Muslim Students Association. In a blog posting on the Huffington Post website, Zogby claimed Asbahi had been a victim of "bigoted websites" and "fear and ignorance about all things Arab and Muslim." Zogby has also defended people who raise funds for Hamas. During a 1995 appearance on the PBS Television show "Firing Line," Zogby criticized the idea of placing limits on "humanitarian activity" of groups with links to Hamas: "That is going to be hell to implement. It's going to prove, I think, very detrimental to the civil liberties of people in this country." Zogby also supported Mousa Abu Marzook, a senior Hamas leader, during his detention in the United States and called plans to extradite him to Israel "destructive." Zogby has objected to suicide bombings on grounds that they benefit Israel politically. Writing in the Muslim World Monitor in February 1995, Zogby complained that, "The bombing of New York's World Trade Center in 1993 played right into the hands of Israel" by illustrating its concerns about Palestinian terrorism. In a December 1995 article in the Washington Report on Middle East Affairs, Zogby suggested that Arabs have suffered their own "holocaust" at the hands of the United States, Israel and European colonial powers. "Arabs may not have experienced the same holocaust [as the Jews in Europe], but if one adds up the Arab lives lost in digging the Suez Canal, the Libyans slaughtered by the Italians, the Algerians killed by the French, the Sudanese murdered by the British, and all the Palestinians butchered in this century – we've had our own holocaust, but it stretches over 100 years." For years, Zogby has staked out positions in line with Islamist groups which reflexively criticize U.S. anti-terror polices. Yet his personal charisma enables him to receive favorable coverage from the mainstream media and administration officials. 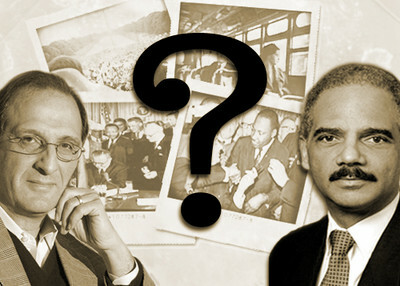 Attorney General Holder did the Obama Administration no favors by selecting a terrorism apologist like Zogby instead of a genuine civil-rights hero to commemorate one of the seminal moments in our nation's history. it's curious, isn't it, that rather than honor a veteran of the struggle for Black civil rights in the USA, Obama's man Holder honors a defender of Muslim terrorists and self-avowed Arab, whereas the Arabs have their own history of oppressing and enslaving Blacks, even of committing genocide against tribal Black Africans in southern Sudan, an Arab state with a large non-Arab, non-Muslim minority?